Reading about the Reverend Worley preaching that gays should be rounded up and put away permanently in concentration camps made me think of the Nazis doing exactly this, and then i thought of poor Alan Turing. I just glanced at the Wikipedia entry on him and was bitterly amused to see all the photos of memorial plaques and statues all over England, and then lists of recognitions and tributes to him that required a good deal of scrolling to display, starting with a clandestine Order of the British Empire in 1945 for his work too highly classified at the time to even describe. Oh, please. The bastards knew he was gay all along but they needed him to decrypt German codes and save his country from the Nazis, so they waited until the war was over to start the prosecution for his crime. They secretly slapped that OBE on him and then proceeded to very publicly persecute him until he had the decency to man up and kill himself. Next i’ll discover that the Roman Catholic Church canonized Giordano Bruno after his ashes had cooled. OK, and not a perfect analogy since Bruno offered no benefit to the Roman Catholic church, so it had no reason to postpone burning him at the stake for his heliocentric heresy. Thus, they didn’t use him and then, when they’d finished, discard him like a soiled wad of Charmin, but you get my drift. Late note: 23 June was the hundredth anniversary of Turing’s birth, and this sparked numerous articles pointing out that his contributions to the development of the computer were vastly more important than merely saving his ungrateful country from the Nazis. Oh, and there’s now a Turing website. 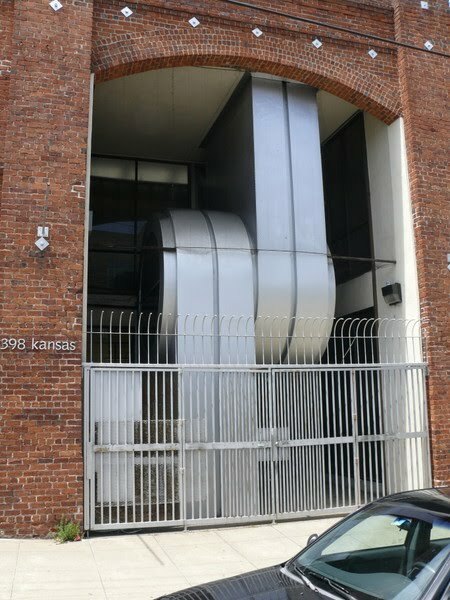 Meanwhile, i spotted this building on 17th Street the other day, and if that’s an elevator device, i definitely want to ride in it. I’m thinking it blows you up to the middle with a blast of warm air, spins you around and over, and then puffs you the rest of the way up on the right side. Quite a lift although there is a small sign over the door. Couldn’t read the whole thing, but managed to pick out the words, “all ye who enter here”.